Born into one of the most powerful families of Rome, Gaius Julius Caesar rose in prestige through his military and political prowess and finally dared grasp the title Emperor from the Roman Republic, only to be murdered by members of the Senate on the Ides of March, 44BC. 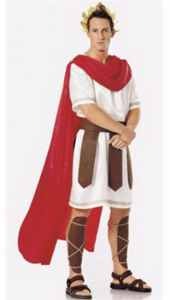 #G439 White tunic with trim, cape, fringed belt, leg armor and circlet. #G439C White tunic with trim, cape, fringed belt, leg armor and circlet.